So in a previous post I talked about my hobby plans for this coming year. I also spoke about the fact that I couldn't decide which chapter to paint up my new space marine army and that I had decided the only route forward was to do all three as Kill Teams instead. So that's the basic premise for this project – three viable Kill Teams, one Crimson Fists, one Dark Angels and one Blood Angels. Then as a bonus round (if I'm not completely fed up with the whole thing), I will attempt a Mk 6 Dark Templar Kill Team (simply to get my DT project kick started). I went out to the local GW shop and bought a ton of plastic kits… but where to start? Next, I read some forums and blog posts about space marine kill team composition and tactics and soon had a plan for my first team. Given that these are the guys I've been looking to build for decades, I thought I'd start with them. I already had a few left over Imperial Fist shoulder pads that I could make use of immediately, so no excuse to delay. The team will be made up of Scouts, regular Marines and Primaris and I want every miniature to be unique and characterful in some way – ideally I want to be able to feel the individual personalities, as well as easily identify them at a glance on the table top. Once this project is done and dusted, if I've enjoyed creating my Crimson Fist gang, I would like to fill out the numbers to make legal 40k squads and try and get a 500 or 1000pt army together. But that is one for later in the year. As a side project (in for a penny, in for a pound) I also plan to create a Kill Team board and collect and paint some suitable terrain for it. I see this as an easy win to be honest – I already have a 4x2 piece of 6mm MDF and buying, building and painting a small Citadel terrain kit would be quick and bag me a square on the Wargame Hobby Bingo Card! Whilst I'm not thinking too much about those at present, I have already acquired the upgrade sprues for both Dark Angels and Blood Angels. 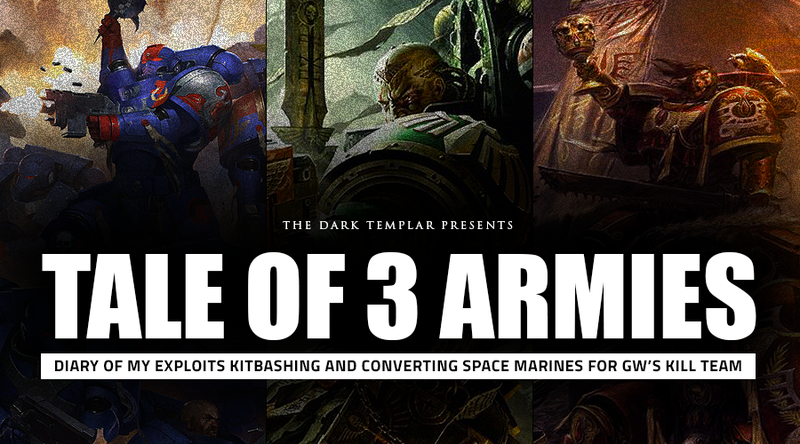 I don't want the composition of the three kill teams to be the same, so there will be some variation in number of regular vs Primaris marines and the weapon load out. Some may be more efficient than others on the gaming table, but I'm not too worried about that at present. Stay tuned for the first update! This project is my way of building up to the more grand schemes (such as Hoth themed boards and 21 Stormtroopers) that I really want to do!